DRMetrix uses automated content recognition (ACR) technology to track the occurrence of television commercials. It takes the industry’s most accurate data to power products like AdSphere™, AVS™, and to drive the next generation of television attribution solutions. All of these applications and more, are only as good as the quality of the underlying airings data. Knowing this, DRMetrix has built the next generation airings verification platform that monitors commercial grade network cable feeds in a DPI compliant manner. 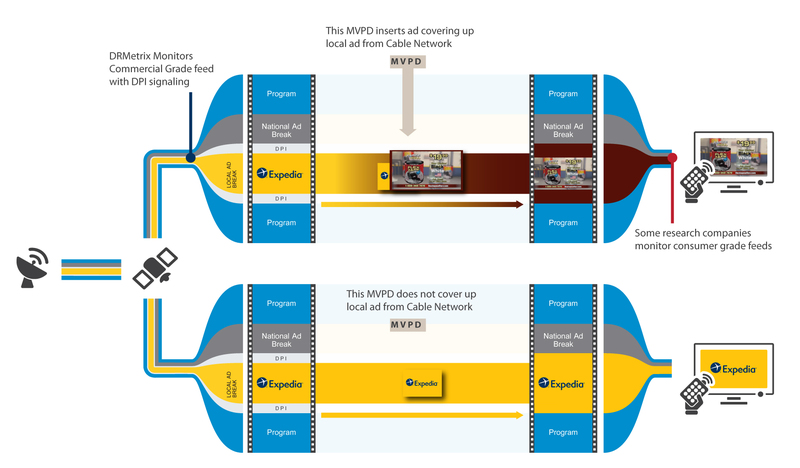 To help explain, let’s review a diagram of how national cable television ads are delivered to consumers. To try and solve for their inability to detect the break type, some ACR monitoring companies have taken to monitoring consumer grade feeds from multiple markets. If they see the same ad appearing in two or more markets they assume it is running on the network and will report the airing as national. There are problems with this strategy because MVPDs are able to insert ads across multiple markets, regionally, or even nationally across their entire footprint. It has become common place to target consumers regardless of locality via programmatic and advanced cable advertising models. Many of these models are able to target viewers across multiple MVPDs as well. Given that targeted cable advertising is the future, the problem is only getting worse over time. Numerous problems exist when airings data from consumer grade feeds is used for competitive media research, airing verification, or for media attribution. Because DRMetrix monitors commercial grade feeds in a DPI complaint manner, we are able to provide the most accurate occurrence level airings data in the industry with the ability to report 100% of cable network airings in both national and local ad breaks!